It is always fun to compare a character with an older version of himself. 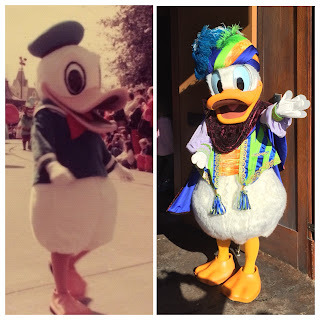 On the left is a shot of Donald from back in 1977. My dad took this photo during the afternoon parade at the Magic Kingdom. On the right is the "Amazing Donaldo" from Storybook Circus. I took this shot this morning while giving a tour of the Magic Kingdom.